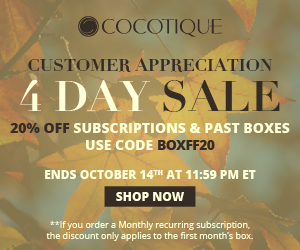 COCOTIQUE: Customer Appreciation Promotion! 20% Off! 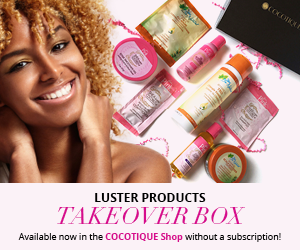 Our Luster Products’ Takeover Box has 8 amazing products from Luster’s Pink and You Be Natural – 2 Shampoos, a Conditioner, Leave-in/Detangler, Scalp Smoother Ointment, Edge Smoother Gel, Oil Moisturizer Lotion, and a Jojoba and Grapeseed Oil for Hair, Skin, and Cuticles. Everything you need to keep you hair and skin looking beautiful this summer. To show our appreciation, we’re offering a whopping 20% savings with the special code! What do you think about this COCOTIQUE 4 Day Sale Special? ← MeUndies: New Subscription Plans Are Here! !